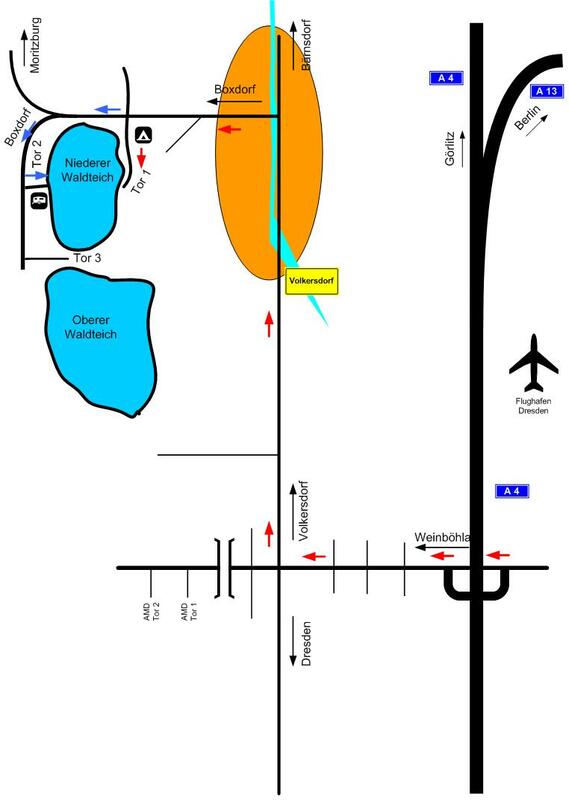 directions - Campsite Waldteichfreunde Moritzburg e.V. Please do not rely on your navigation device, unless you navigate with the specified GPS coordinates. Exit the motorway 4 at the junction Dresden Airport and turn left into the Wilschdorfer Landstraße in direction Wilschdorf/Moritzburg. You have to follow the red arrow on our little Card at the bottom an turn right into the Radeburgerstrasse in direction Volkersdorf. About 750 meters after the entrance sign, turn left over a small bridge and head towards Moritzburg until the beginning of our „Waldteich“ and the sign to our campsite. Please follow this way until the entrance and call the following cell-phone-number +4915209886958 if the entrance is closed. You have to follow the red arrow on our little Card at the bottom an turn right into the Radeburgerstrasse in direction Volkersdorf. About 750 meters after the entrance sign of Volkersdorf, turn left over a small bridge and head towards Moritzburg. Don’t turn left at our Campsite sign, continue straight along the blue arrow on the main road until you reach our Entrance two. And then call the following cell-phone-number +4915209886958 because the entrance normally is closed. 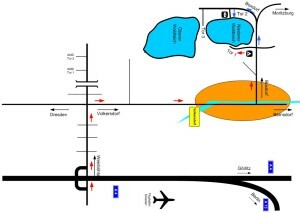 If you arrive after 8.00p.m or before 8.00a.m, please contact us in advance.